Within 2 hours of Melbourne this multifaceted freehold is priced for a speedy and no-nonsense sale and represents unbelievable value for money! 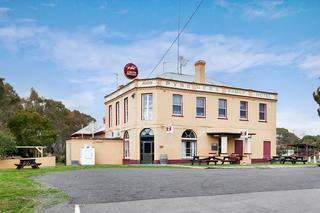 Situated on 2024m2 (0.50 acres) corner allotment the Pyrenees Hotel is constructed of a solid brick hotel which was established in 1859 and enjoys a vast floor area around 375m2 (40 squares) and houses six upper level accommodation rooms with spacious lounge and two modern guest bathrooms. The lower level hotel section houses a well-appointed bar, dining room (seats 50), games/pool room, modern and fully equipped commercial kitchen and a comfortable manager’s residence. Outside beer garden DLUG/Workshop and the historic police lock-up. You will enjoy no competition in this friendly and vibrant community, with figures evidencing strong local and passing patronage and returns commensurate with your effort and potential limited only by your imagination!